"A GLORIOUS BLAZE OF PASSION AND FURY? RICHLY FUNNY" (The Times). WRITER. WIFE. LOVER. MOTHER. MUSE. 400 years ago Emilia Bassano wanted her voice to be heard. It wasn't. Could she have been the "Dark Lady" of Shakespeare's sonnets? What of her own poems? Why was her story erased from history? 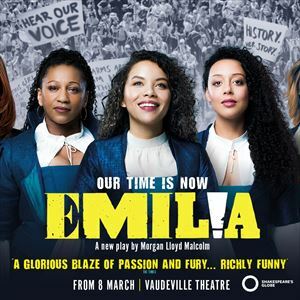 Emilia and her sisters reach out to us across the centuries with passion, fury, laughter and song. Listen to them. Let them inspire and unite us. Celebrate women's voices through the story of this trailblazing, forgotten woman. Shakespeare's Globe's "EXTRAORDINARILY ROUSING NEW PLAY" (The Independent) which met with "WHOOPS, CHEERS, BELLY LAUGHS, A STANDING OVATION" (Time Out), now explodes at the Vaudeville theatre. An all-female cast playing both hers and hims rouses "AUDIENCES INTO A PITCH OF FERVOUR" ( The Guardian) in a "MAGNIFICENT PRODUCTION" (The Stage) filled with "WIT, FIERCE INTELLIGENCE AND HEADY INTENSITY" (The Times).